Oh OK. It’s that time again for Canada’s favourite annual contest, Roll up the Rim, which we, at xsamplex, faithfully cover. We might just as well jump at and do some sleuthing at this year’s numbers. A grand total of 260,959,840 winning cups have been produced this year: this is about 25 million (MILLION) less than the year before. 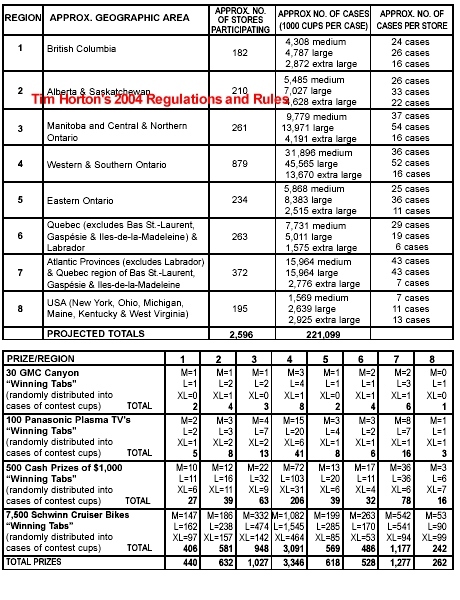 Every region is losing here, that is, except for Quebec: it’s gaining almost 4,000,000 more cups. The biggest loser this year, however, is Ontario. The Maritimes however, like 2012, 2011 and 2010, are losing out again: by over 6 million cups this year. Prize-wise, it looks like Tim Horton’s is going back to the 4 major prizes: We have a car again (the Toyota Rav4 again, which was last sighted in the 2010 contest), pre-paid Mastercards (no electronics and/or TV this year! ), the traditional gourmet set and of course, the 100 dollar Tims’ cards. The Prize/Region ratio shows an almost similar distribution as the amount of winning cups: Two regions lose out (Ontario and Atlantic provinces), not including the US. Secondly, there are a whole of less prizes to win than last year. 2012 and 2011 had 5 major prizes. 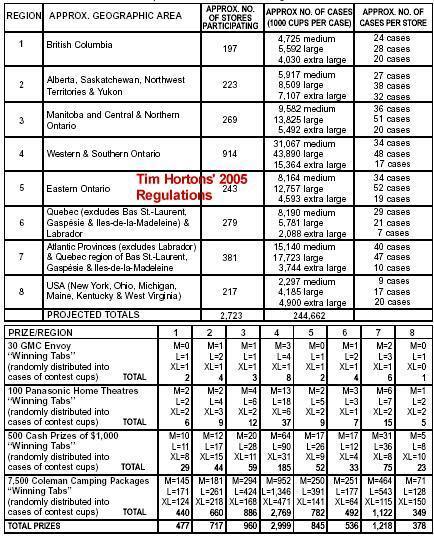 In 2013, it looks like Tim Horton’s is going for a lot less. My advice this year is like the ones before: if you win a monetary prize, please donate 80% to me. Thanks. Previous entries: 20122011, 2010, 2009, 2008, 2007, 2006, 2005, 2004, 2003 and 2002. Or click this tag for all posts tagged with ‘Roll Up The Rim’. This entry was posted in xsamplex and tagged Roll Up The Rim on February 21, 2013 by Arthur. Now that vacation is sort of settling in, the following links attracted my full attention. In order of interest and heritage. I think. For some reason, the sentence looked silly to me: however, apparently it’s correct Dutch. I tend to think that by 2020, there won’t be such thing as a ‘Dutch language’. What will happen to the game if I am playing and lose my internet connection – will the game still be playable and update the servers when my internet connection resumes or will it pause and wait for the connection? The EA devs never really responded to the question and the rest is history (permalink to comprehensive ‘will not buy if’ thread). Honestly, some of the blame falls on Steam for this one. Obviously the info was written by the WarZ guys and then sent to steam, but it’s obvious no fact checking happened. The follow-up thread (after the producer changed the description/feature list on Steam) still cried foul and eventually, Steam decided to stop selling the game (Forbes link), offering people refunds. The whole incident reminds me of the ‘Sword of the Stars II’ farce that happened last year (previously on xsamplex). The moral of the story is that, if you publicly over-sell your over-promised games on the Internet, you will not get away with it. I guess, that Reddit users (and gamers) are a force to reckon with. This entry was posted in Hyperlinks, Video Games and tagged Dutch language, Reddit, Steam, WarZ on December 25, 2012 by Arthur. Mass Effect 3, then. Shepard and EDI, at it[/caption] So yeah: by now you may have already read my review of Mass Effect 2. If you didn’t, go read that first. Mass Effect 3 was released this year (wikipedia), with plenty of fanfare and controversy. First of all, there was the spat about DLCs that featured extra footage (scenes so you will) that were crucial for the storyline. Secondly, EA, owner of Bioware, decided to bring out Mass Effect 3 for their digital content delivery system, Origin, only, therefore ignoring requests from many fans to deliver the game thru Valve’s Steam. Thirdly, many game reviewers jumped the gun by calling this the best game of the year, which it isn’t. So what’s new and what’s not new? The game is once again heavily scripted, dumbed down and generally, feels shorter than ME2 (I finished the game in 26 or so hours). Maps and levels, generally don’t take long to finish and worst yet, when leveled up, feel easy to take on. You hear that right: it feels shorter and it feels easier. I think, there were only two maps/missions that were fairly tough only because both of them pitted you against banshees. My general feeling about ME3 is that you can’t really call it an RPG: the choices that you have to make during many cutscenes generally have two answers: you can either pick evil or not so evil. Even that is sort of a step back from ME2, let alone ME1. However: the story line is epic and while hard-core fans didn’t agree with the ending, I feel this game is an appropriate end to the Mass Effect lore. Sure you knew Shepard would die eventually (well, if you play it in a specific way you can actually have Shepard survive, but this implies that you gathered every ‘war assets’ that you can find). And that’s, I guess all I wanted to mention in this posting: Mass Effect 3 is a worthy game if you already played the earlier ones. If you haven’t played the first two games, you might miss references. Dumbed down and what not: my general feeling after finishing this game was a sigh of relief. I’m not sure what Bioware is planning and cooking up, but I surely hope they leave the Mass Effect world alone now. If not, I’m certain I will not buy into their crap any more. And that’s all I’m going to say about this. This entry was posted in Video Games and tagged mass effect, video games on December 16, 2012 by Arthur. I‘ve been playing Civilization 5 (wikipedia link) now for a while and I’m still mixed about it. If you played and loved Civ4 (Earlier here): it’s nothing like it. The game designers drastically changed several game features: First of all, everything plays now on a “hex” map. Secondly, stacking up units is not allowed any more. Most importantly, politics has changed. This is actually the part that bothers me the most. Since Civ 1, choosing your nation’s political affiliation resembled known types of political structures we’ve seen in recent history. You wanted to focus on trade, surely you could choose to lead your nation as a Republic or Dictatorship. Civ 5’s political system feels extremely dumbed down. So, that being said: the game’s graphics, music and general presentation are top-notch as always. To get the most out of the game, you would probably need to get a PC that has more than 2 cores and an extremely capable graphics processor. Anything lower than a third generation i5 or i7, will most likely feel a ‘grind out game’. Turns generally seem to take longer (compared to Civ4). At the launch of this game, Firaxis claimed that their Civ 5 engine was their most scalable game engine, able to use multiple cores: If you have the time for it, witness Meier’s presentation. Upon release, however, the game was buggy as hell. Only 4 or 5 months after release, Civ 5 sort of became playable. Add to the fact that the DLC “Gods and Kings” finally added Religion and Spying mechanisms, you can say that Civ 5 is sort of turning into a classic: Mind you, a reluctant classic if you compare it with Civ 4. Civ 5, however, does battle pretty well. Battles now feel sort of ‘real': You’ll need to plan the location of your cities so you can take advantage of the terrain and force possible bottlenecks upon your enemies. To conquer cities, you’ll find you have to push your cities to max to generate a steady stream of cannon fodder. Additionaly, cities now have basic defence mechanisms. Would I recommend it? Reluctantly, but only if you get the “Gods and Kings” DLC: Besides adding religion and spying, it changes several core game play mechanisms. It seems to be a lot more playable in higher levels as well. My frustration score is obviously higher: I’d rate a solid 6. God, the game so obviously needs more peddles. But besides the frustration, winning the game is absolutely rewarding. With the release of Steam Workshop, people can now even create their own mods for Civ 5. “A+ would plai agian”, as they’d say on the Internet. This entry was posted in Ordinateurs, Video Games and tagged civilization, Civilization 5 on December 2, 2012 by Arthur. What is funnier than ‘America’s Funniest Home Video Show’? Why, items that are wrongly priced on on-line shopping sites! I mean, a 10,000 dollar laptop that features a second generation i3 processor, a tame Radeon processor and yes, 6 GB of RAM. Surely, that RAM is solid gold. No? A month or so ago, I finished watching all seasons of the show ‘A Game of Thrones’ (HBO Canada), an award-winning TV series based on George R. R. Martin’s Fantasy books ‘Songs of fire and ice’. I was advised it was pretty good, and sure, it was pretty good. The show is known as the most downloaded show on the Internet as HBO had refused to sell the show on DVD (or something to that matter: I can’t remember the details). I had already started on George R. R. Martin’s books on July the 6th and as you may have noticed from the books-library, I finished the current known last entry of the series, “A dance of dragons”, just a week or so ago. All the titles in the series are long and, while at times slow to develop, fairly good reads. The major question is that Martin still has two titles to write and looking at the pace of the HBO series, I fear that the show is catching up with the books before Martin can officially finish them. This entry was posted in Hyperlinks and tagged A Game of Thrones, laptops, Songs of Fire and Ice on October 26, 2012 by Arthur.